Small and mid-sized businesses had a great 4th quarter, as new data from Bigcommerce reveals that independent e-commerce businesses saw a 34 percent average increase in sales during October to December 2014. According to the data, this growth was led by the consumer electronics, beauty, bridal and fashion categories, which all benefited from consumers shopping online during the holiday season. In fact, 2014’s “Cyber Five” holiday shopping weekend (Thanksgiving Day to Cyber Monday) represented nearly 12 percent of all sales for the quarter, while sales volume on Cyber Monday tripled that of the top sales day for Q1. Data also shows that retailers processed 24 percent more orders during 2014’s Cyber Week and averaged 27 percent higher revenues than 2013. It is also important to note that BigCommerce’s data found shoppers buying from independent online retailers used a mobile device to complete 30 percent of their purchases in Q4, while merchants received 25 percent of their total revenue through tablets and smartphones. 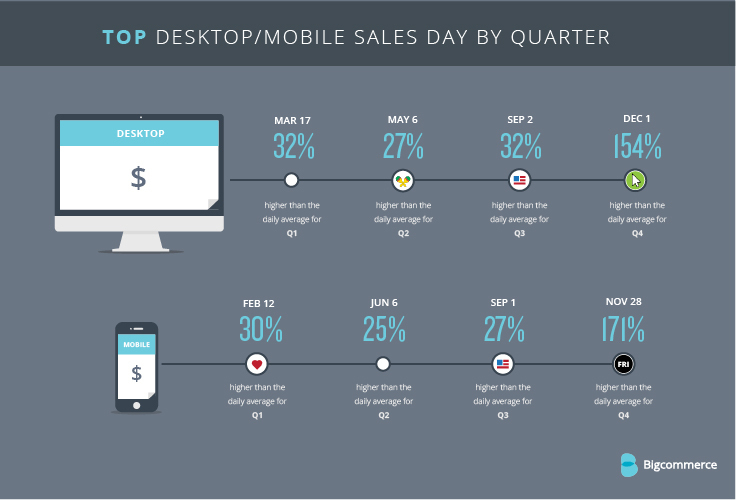 Mobile devices were also big for last-minute shoppers in 2014. For instance, merchant data reveals that 37 percent of shoppers used a mobile device to complete a purchase on Dec. 25, 2014, which is twice the amount of mobile purchases that took place on Christmas Day in 2013. Lastly, Bigcommerce’s data sheds light on the top U.S. cities with the best-performing online businesses – based on aggregate sales and purchasing volume. According to the data, Los Angeles, Austin and Chicago topped the list. That said, the cities New York, Houston and Chicago are homes to the most active e-commerce shoppers for small and mid-sized businesses.